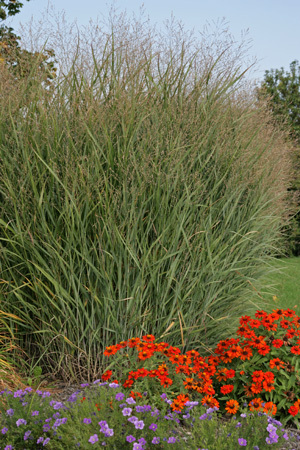 Switchgrass is a native prairie grass that adapts well to gardens. 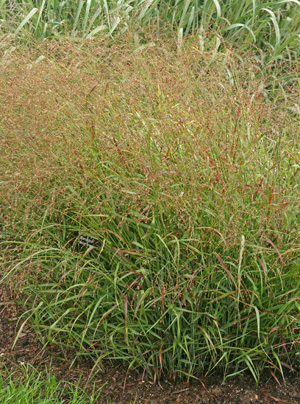 Switch grass, Panicum virgatum, is one of many native prairie grasses that have been developed as ornamental grasses. Switchgrass – also called tall panic grass, tall prairiegrass, wild redtop, thatchgrass, and other common names – is one of the main species of grasses of the North American tallgrass prairie, ranging from southern Canada (south of latitude 55°N) to Mexico over most of the United States east of the Rocky Mountains. It can be found in remnant prairies, in pastures, along roadsides in many areas, and even in brackish marshes. In the garden this species can provide nearly year-round interest, as the plants remain upright throughout the winter. But is it also employed for soil conservation (to prevent erosion) and as forage or hay for cattle (but not other livestock), and its use as a biofuel has been explored by researchers. It is hardy in zones 3-9. Ornamental cultivars tend to have a dense, columnar form. 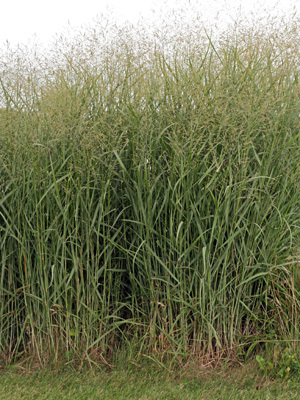 This long-lived perennial grass typically grows 2½-5 feet tall, slowly spreading by short rhizomes in all directions. It is a warm season grass, so does not start growing until late spring. The species is quite variable in amount of growth, height and cold tolerance, sensitivity to moisture stress, and rhizome vigor. 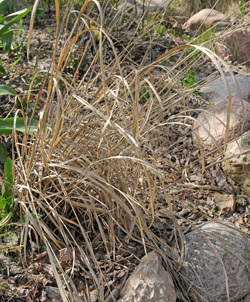 Some types have more of a bunchgrass habit, while others tend to be more sod-forming. All types are deeply rooted, growing a few to several feet deep in the soil. The plants – especially the ornamental cultivars – tend to have a dense, columnar form, with stiff round stems. Although rain or snow can bend the stems to the ground, many cultivars quickly bounce back up once the weight is gone; some of the taller ones are more susceptible to flopping. The narrow leaves have a prominent midrib and there is a white patch of hairs where the leaf attaches to the stem. The medium green foliage may be tinged with red and turns various shades of yellow in the fall, bleaching out to beige over the winter. ‘Heavy Metal’ from late spring (L) to summer (LC), with colorful fall color (RC) and dry, tan foliage in winter (R). Switch grass blooms in mid-summer. The airy, pink-tinged flower spikes rise only about a foot or two above the foliage. The inconspicuous flowers with burgundy anthers and stigmas dangle from the well-branched panicles. The flower spikes can be used in fresh or dried arrangements. Teardrop-shaped seeds about 1/8 inch long develop from single-flowered spikelets. Ripe seeds may be pink or dull purple at first, but turn a golden brown in autumn. The seed plumes persist well into winter, with the seeds eaten by songbirds and upland gamebirds. Self-sowing is usually minimal, but can be prolific under ideal conditions, and seedlings are frequently very different from the parents. 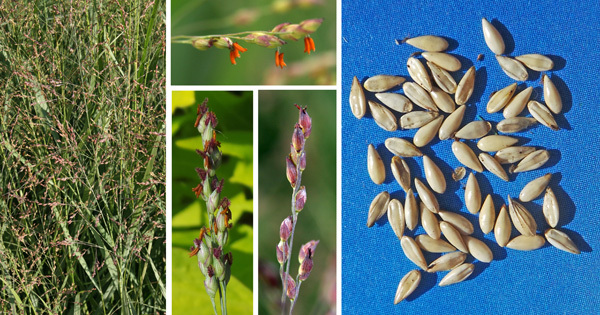 Switchgrass blooms in airy panicles (L), with inconspicuous flowers with orange to burgundy anthers (C), followed by tear-drop shaped seeds (R). ‘Dallas Blues’ creates a backdrop for a bench in a garden. 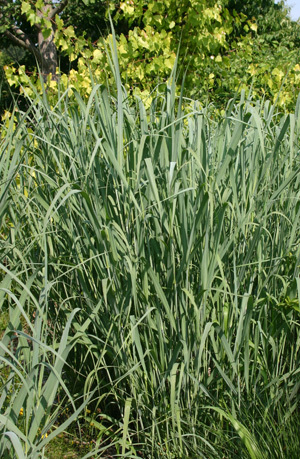 Use switchgrass massed or in groups at the back of perennial borders, in mixed plantings or in prairies and native gardens. This native grass mixes well with late asters, sedums, Echinops ritro, red shrub roses, smoke bush (Cotinus sp.) and garden phlox, as well as native prairie plants such as purple coneflower, rudbeckias, sunflowers, bee balm, and Liatris. In prairies it is found along with big bluestem (Andropogon gerardii), little bluestem (Schizachyrium scoparium), Indiangrass (Sorghastrum nutans), and other grasses and forbs. ‘Heavy Metal’ provides a vertical element in a container. It can be used as a focal point or as a vertical element in contrast to rounded or spreading plants in perennial gardens. Try combining it with cardoon for a color echo and great contrast in texture and form in a mixed border. It can also be used as a seasonal screen or near water or bog gardens. Try using small divisions as a vertical element in containers with a variety of annuals or tender perennials such as Plectranthus or coleus. Some taller cultivars tend to flop. Switch grass grows best in full sun and moist soil, but adapts to a wide range of soils and weather conditions, and will tolerate partial shade (although it may flop in too much shade). Once established it is drought tolerant and grows well in high temperatures. 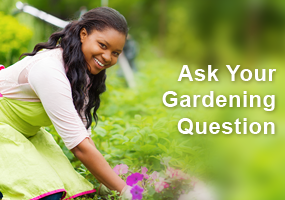 In rich soils the plants may flop and require staking. The clumps can be left standing through the winter and cut back to a few inches from the ground in early spring before growth resumes. This species has almost no insect or disease problems and rarely needs fertilizer. They do best when divided every three years. 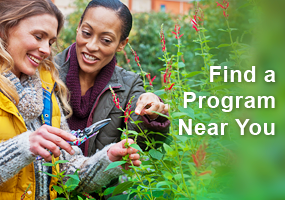 Old foliage should be cut back in spring before new growth appears. ‘Cloud Nine’ – is a tall selection introduced by former Bluemount Nursery of Maryland that can reach 7-8 feet, with light metallic blue leaves and gold fall color. 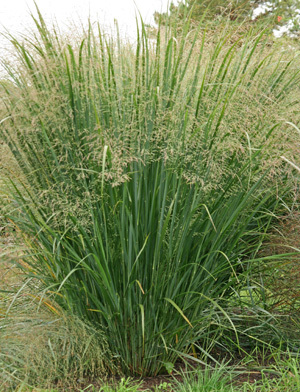 It makes a good substitute for some of the larger Miscanthus cultivars. Zone 4. ‘Dallas Blues’ – is a 5 foot tall selection originally found in Dallas and introduced by Change of Scenery Nursery in Columbus, Ohio. It has powdery blue leaves that turn copper in fall and remain well colored through the winter, and pinkish-purple flower plumes. The leaves are wider than many other cultivars, and plants have a fuller shape and denser flower spikes that appear in distinct layers. It is more drought tolerant than many cultivars. Patented (US PP11,202) in 2000. 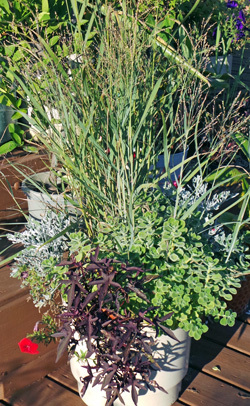 ‘Heavy Metal’ – a Kurt Bluemel introduction with tightly upright cool blue-green leaves that turn rich amber in fall and fade to light tan by winter. The compact plants are only about three feet tall, with taller flower spikes with strong pink tones, and dark burgundy seeds. Zone 4. ‘Northwind’ – is a vigorous, very upright selection by Roy Diblik at Northwind Perennial Farm in Lake Geneva, Wisconsin, growing up to 5 feet tall with steel blue foliage that turns tawny gold in fall, and maroon and green flower plumes held incredibly erect above the foliage. 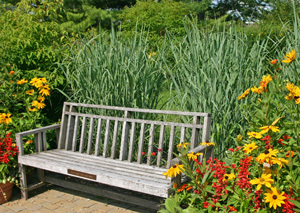 ‘Prairie Fire’ – from Amber Wave Gardens, Benton Harbor, Michigan has green foliage that turns shades of deep red in early summer – much earlier than other red cultivars – and butter yellow in fall. The upright clumps grow 4-5 feet tall and 1½-2 feet wide. the leaves curl slightly when the rosy panicles appear. PPAF. ‘Prairie Sky’ – discovered growing wild in a Wisconsin meadow, it is one of the bluest selections (but not as sturdy as some so may flop more in wet conditions) that grows 4-5 feet tall, with silvery inflorescences. ‘Shenandoah’ – is a German selection that grows 3½-4 feet tall and has red leaf tips early in the growing season and burgundy fall foliage color with burgundy seedheads. There are also a number of selections for agricultural or conservation use that were chosen for attributes other than their appearance. The grass is realy beautiful, good job! I cut my shenandoah switch grass back about a week ago. It still looks brown with no new green growth; is this normal? I have my switch grass in full fun in my “dragonfly” garden. It does beautifully and I do like the height it gives. 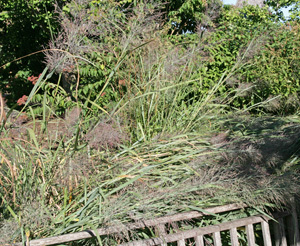 A fellow master gardener and I inherited switch grass as part of the planting area we were asked to beautify. I had noticed its hardiness, but was unfamiliar with its maintenance. 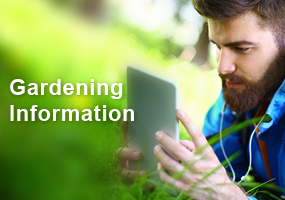 Thank you for publishing your knowledge on these plants – a great help. Well detailed overview of grass plantings for native prairie environments and soil conservation.